What Do You Think? Ethical Dilemmas. Home/What Do You Think? Ethical Dilemmas. 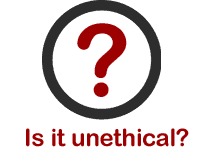 Engineering Ethics is not always a black and white decision. Each case has subtleties and nuances that can become quite interesting. That’s what the PDHengineer Monthly What Do You Think? Ethical Dilemma is all about. Each month we find a compelling case that has been presented to the NSPE Board of Ethical Review. We’ll give you the facts, and then ask for your opinion. Once your vote has been registered, you’ll be able to take a look at the Board’s discussion and ultimate decision on the case. Then, a few days later, you’ll receive the results of the peer survey. Maybe you’ll agree … or maybe not. Either way, it’s thought-provoking. So, be watching for the monthly emailed case. Meanwhile, you can view the previous cases we’ve presented. Be watching for the first in this series coming in late April 2019.